Not only was I excited to have won some of the same editions that I had seen featured on the blog, but I was also happy that Michael Popek had included a copy of his own book, which I had had my eye on ever since it was featured on NPR's Book Seller's Picks of the year's freshest reads. If you follow the blog Forgotten Bookmarks, you'll find the book to be quite similar in content, but even better because it's in book format. One day, I came across a copy of a fairly common microwave cookbook - the sort of published by the appliance manufacturer to make a few extra dollars. By then, it was habit for me to flip through the pages looking for a lost treasure, and this book didn't disappoint. Near the end of the book, I spread the pages to discover a very large marijuana leaf, dried and pressed and in perfect condition. There was something about a pot leaf stuck inside this hurry-up cookbook that sent me into hysterics. I had visions of the impatient stoner, desperate with hunger, reaching for the book and marking a recipe with the item closest at hand. Some of the "bookmarks" featured are funny, some angry, some sad, but all interesting. Even better, I found a treat inside the pages of Popek's book itself. He was kind enough to include one of the original forgotten bookmarks that he featured in his book. It is pictured on page 93 and was found in Zen and the Art of Motorcycle Maintenance by Robert M. Pirsig, published by William Morrow and Company, 1974. (I also received a copy of this book in the prize pack.) I was delighted to find this forgotten bookmark and share some of the excitement that Popek experiences when he finds other forgotten bookmarks. All in all, this book was a delight to read. Popek keeps the commentary to a minimum throughout, explaining that he would rather present the "material in this book more like a museum curator than a critic." 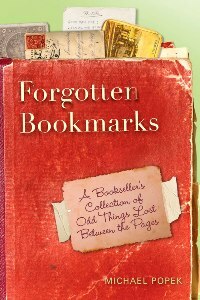 I found that Forgotten Bookmarks speaks to the importance of physical books, as keepsakes and depositories, highlighting a time before ereaders, even before emails, when writing letters and developing film were the norm. For me it evoked an odd sense of nostalgia for a time that I barely got to experience for myself. It really is a testament to books and the unique ways reading can bring us together. What an awesome prize to win! I love that he included one of the forgotten bookmarks. This is one book that I thought would make a great gift for anyone who is reader, regardless of their taste in books. I loved it - and I love his blog. Seriously, I can't wait to take a look at this. I LOVE finding little forgotten things between the pages of used titles. I think I once found a 5 dollar bill, which I thought was a little funny. I also love that he included one of these bookmarks. I also wonder what it would be like to come across your own forgotten bookmark in a book like this...would you remember? Cassandra, You're right this would make a great gift for book lovers of all kinds. Beth, Good question. I think you would remember depending on how personal it was. If it was a receipt, maybe not. But if it was a letter you wrote, probably. I've come across a select few forgotten bookmarks in my own reading, but I have come across some of my own, which is always fun too! Sounds like an amazing prize! I've had my eye on this book for a while, it just sounds so interesting. Glad it lives up to expectations! That is awesomely cool! :) I love finding things like that in books I buy second hand or get at the library. I have one that I kept that's a note in German, but I haven't translated it yet. What a great box of books! I tried to win this one on goodreads, I was gutted that I didn't actually get it! HOW the HELL did I not know about this blog and book and stuff??!! Finding things in books is one of my FAVORITE things ever in life!!! Congrats on the win, and I can't wait to start following. Oh that sounds like a fun book! I've found Christmas gift tags, and once a plane ticket in used books. I love finding things like that.